Summer’s finally here and you’re itching to dive into some fun-filled time in the sun. But not so fast: The first stop on your must-do summer bucket list is shielding yourself from those blazing rays. If you’re thinking of foregoing sunscreen, you know, “just this once,” in exchange for a sun-kissed glow, then think again. The UVA and UVB rays the sun throws down can bake wrinkles and sunspots into your skin before its time, and much worse, may increase your odds for skin cancer. Skin cancer is the most common cancer in the United States, and the American Academy of Dermatologists (AAD) estimates nearly 9,500 people in the U.S. are diagnosed with skin cancer every day, and one in five Americans will develop skin cancer in their lifetime. Protecting your skin from the sun is serious business, so it’s not a surprise if you feel lost at sea when it comes to picking out the best sunscreen. What SPF do you really need? Which ingredients should you avoid? Which is better: lotion, spray, or stick? Get the answers to all your burning questions right here! There’s no such thing as “healthy” tan. 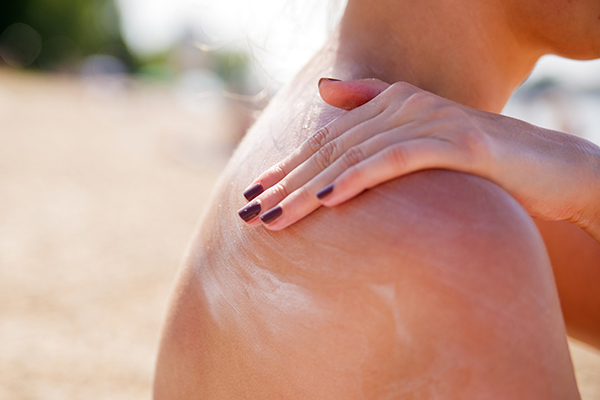 A tan is actually a skin injury as a result of sun damage. Getting a “base tan” at a tanning salon before you bake yourself under the real thing will not protect you. At all. In fact, you should avoid indoor tanning altogether: Research shows that indoor tanning can raise your risk of developing skin cancer by 59 percent — and that risk increases with each visit. Having a dark skin tone doesn’t mean you can’t or won’t burn; anyone of any skin color can be vulnerable to sun damage. Edible sunscreen = big nope. You may have heard about pills or drinks that claim to protect your skin from the sun, but so far, there’s no scientific proof that they work. Broad spectrum. This means your sunscreen shields against both UVA rays (which hit the deepest layer of your skin and can lead to aging and skin cancer) and UVB rays (which target the top layers of your skin and cause you to burn), providing you with maximum protection. Water-resistant or very water-resistant: Even if you’re not going swimming, summer heat can cause you to sweat, making it hard for sunscreen to stay put. Water-resistant sunscreen products will better protect your skin even when wet. But remember, no sunscreen is completely waterproof or sweat-proof. If your skin gets doused, you need to reapply. Madani adds the importance of picking a product you’ll use every single day. That means the daily sunscreen you select is easy to apply, doesn’t irritate your skin or eyes, is fragrance-free (or at least free of any off-putting odors for you personally) and doesn’t make you feel like a gigantic greaseball. Whichever sunscreen you pick, it’ll only protect your skin if you use it correctly. The AAD recommends applying sunscreen to dry skin 15 minutes before you go outside, so you’re fully protected as soon as you step out into the sun. But don’t forget gray skies, too. You should use a full ounce — or the amount that would fill the palm of your hand or a shot glass — to cover your entire body. “Most people only apply about 25 percent of the recommended sunscreen,” Madani says, adding that doing so reduces the full benefits of the SPF. “People tend to apply sunscreen to the face and arms, but ignore other body parts that are exposed to the sun, most commonly the back, the legs, the feet and even the lips.” And for those of you with thinning hair or balding scalps, Madani reminds you to take cover beneath a wide brim hat or wear sunscreen up top to protect that noggin. Set your phone to remind you to reapply every two hours (every 40 to 80 minutes when using water-resistant sunscreen) or do so right after swimming or sweating. And don’t forget to apply if you’re going on summer road trip — or just spending a lot of time on the road during your commute. The sun can still do damage even if you’re sitting in an air-conditioned car with the windows up. Chemical sunscreens: These contain active ingredients such as oxybenzone, avobenzone, octisalate, octocrylene, homosalate and octinoxate. Physical, or mineral, sunscreens: These contain active ingredients such as zinc oxide and titanium dioxide, which can be slightly confusing since these are chemicals, too. So which one is better? Well, it depends on who you ask. Both types can protect you from the sun, but chemical sunscreens have gotten a bad rap, especially from the Environmental Working Group (EWG). The EWG claims the chemical filters (specifically UVA- and UVB-blocking oxybenzone) found in chemical sunscreens may mimic human hormones and actually cause cancer. However, the AAD, the Skin Cancer Foundation, and some dermatologists disagree, saying evidence proves the oxybenzone dose in sunscreens is at a level safe for humans. Throwing one more wrench into the dispute are the 2017 annual sunscreen rankings released by the EWG and Consumer Reports (CR). EWG, which calculates its ratings based on the stated SPF and the level of chemicals a product contains, shows mineral sunscreens topping their list. Meanwhile, CR, which tests products on the human skin exposed to water and UV light, says more mineral sunscreens weren’t as effective at keeping skin from getting toasty as did their chemical counterparts. Note: For wee ones under six months of age, the FDA recommends keeping them out of the sun and covered up, and consulting your health-care provider before using sunscreen on them. You’ll need to do a bit of trial and error to find what’s best for you, and we’ve narrowed down some choices based on the 2017 lists of CR and the EWG. That said, Dr. Madani warns to avoid getting too bogged down in the details. The one caveat to this is if you have sensitive skin or notice irritation when using chemical products. “I recommend using a mineral sunscreen then, as these are usually deemed non-allergenic, ” he adds. Trader Joe’s Spray SPF 50+: No longer just the place to score two-buck Chuck and cauliflower pizza crusts, Trader Joe’s is also where you can nab a $6 bottle of sun protection. With a CR score of 100 (the highest possible), this broad-spectrum chemical sunscreen spray is commended for its overall performance, classic beachy smell, with notes of fresh mint, and good skin feel. Badger Active Unscented Cream SPF 30 Sunscreen: Based on scale of one to 10, with one being the best score and 10 being the worst, this sunscreen receives high praise from the EWG. And while the EWG and CR lists don’t tend to match up in rankings, this sunscreen did receive an overall CR score of 46, or “good,” falling in the middle among the recommended products. Free of fragrance and mineral-based, this sunscreen is a good option for those with sensitive skin. However, like many mineral-based products, reviewers note that it goes on thick and needs to be rubbed in quite a bit to avoid a residual white cast. Equate (Walmart) Sport Lotion SPF 50: Scoring 99 out of 100 on the CR list, this lotion-based, broad-spectrum chemical sunscreen is an inexpensive, effective choice for skin protection at just $5. It is scented with a combo of floral and citrus, for a moderate beachy smell, so make sure the aroma isn’t too strong for your liking. Banana Boat SunComfort Clear UltraMist Spray SPF 50+ Sunscreen: The Banana Boat brand has long been synonymous with summertime, so it’s no surprise this broad-spectrum chemical sunscreen spray was high on the CR list with an overall performance score of 97. If you like piña coladas, this one’s for you: The tropical coconut scent goes on smooth with little residue. Thinksport Safe Lotion SPF 50+ Sunscreen: If mineral sunscreens are the option you prefer, consider this lotion-based product that made the cut of both the EWG and CR lists. While it didn’t rank high with CR, only pulling in a “fair” score of 22 thanks to taking a long time to rub in and leaving a white cast and tacky film, the EWG gave it a top score of one among their best beach and sport sunscreens. Now that you’ve picked out your sunscreen, don’t forget the accessories that can help protect the skin you’re in: wide-brimmed hats, UV-blocking sunnies, and clothing made with sun-protective fabric. Now go forth and enjoy your summer!